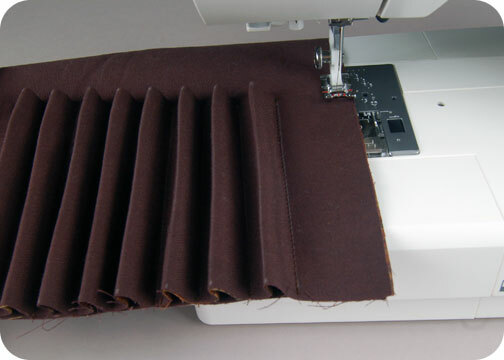 The pleating techniques, mat board, and turn lock aren’t so hard on their own, but all amassed together they start to make this project a little difficult. 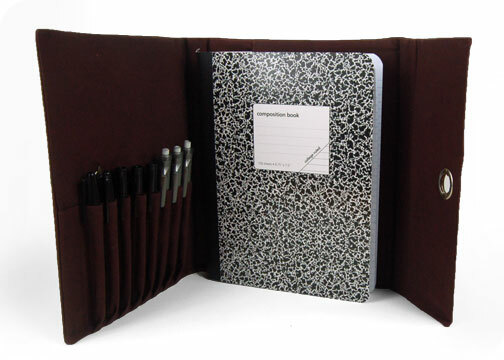 Makes one journal that is 8¼” x 10¼” and fits one standard 7½” x 9¾” composition book. 1. First we’re completing the pencil slot portion of the journal. 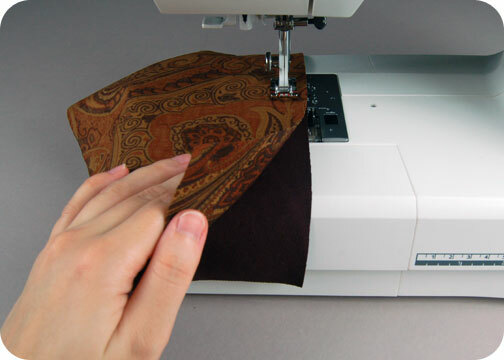 Do this first by matching up your pencil pocket piece main fabric piece with its corresponding lining piece. 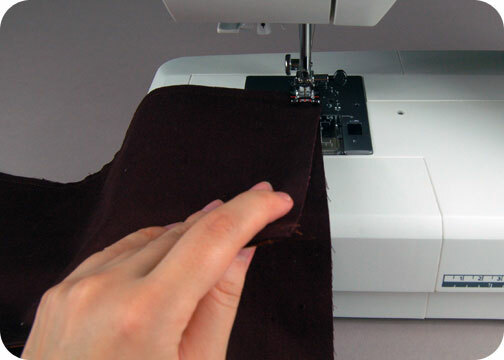 Line up the upper raw edge, matching the single notch, then sew the two layers together. 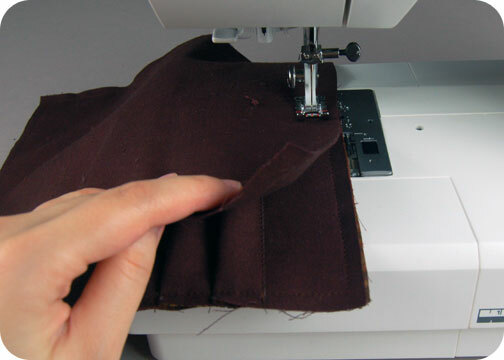 Press the seam, then flip the pieces over so the right sides are facing out. Then press the piece again so the top edge is crisp. 2. Now we’re going to start building the pencil slots. Take your fabric piece labeled Journal Inside-Left, and line up the bottom left corner with the bottom left corner of your pencil pocket piece. The pocket should be longer than the inner journal piece and run off the edge, but we’re going to pleat the pocket until it fits. 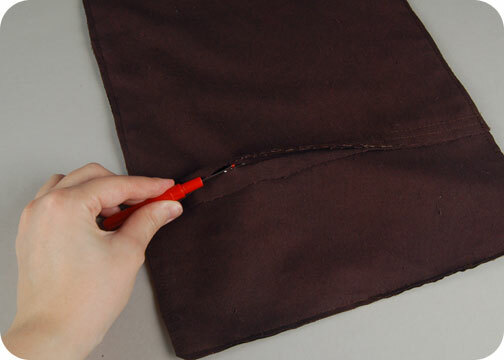 Begin by basting the left side of the pencil pocket to the Journal Inside-Left. 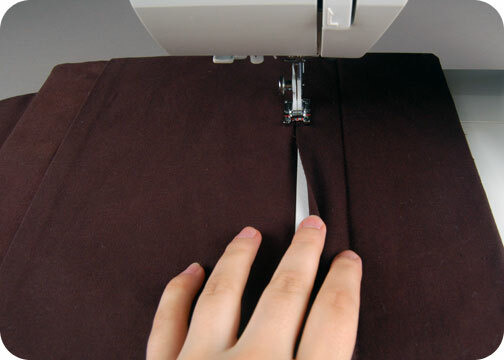 Then stitch the pocket in place along the first stitching line as the picture illustrates. 3. 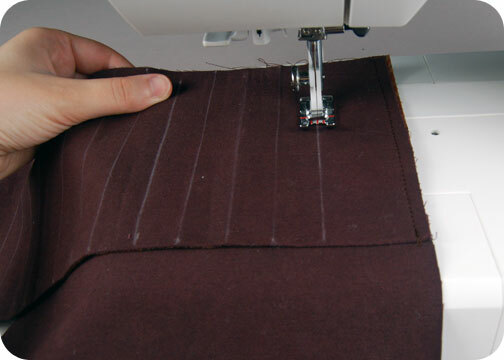 We’re going to form the slots by folding the pocket along the pleat lines. Here you see I’ve taken the first pleat line and folded it towards the recently sewn stitch line. 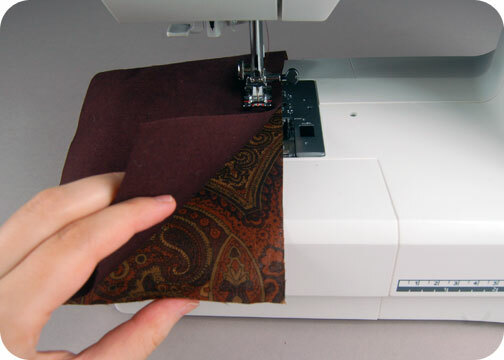 With that fold in place, sew the next stitch line as indicated by the pattern guideline. If you’re doing it right, the bottom edge of your pocket piece will always be flush with the bottom edge of your Journal Inside-Left piece. 4. Here’s the next pleat being made. 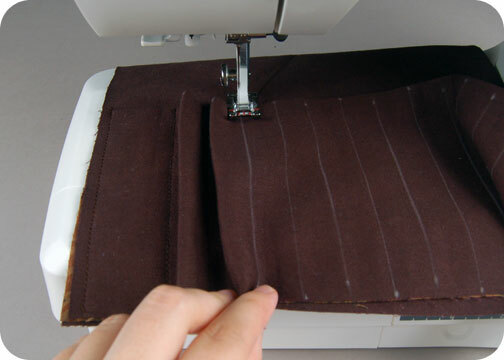 Once again, fold the next pleat line towards the previous stitching line, then sew the next stitching line beside it. 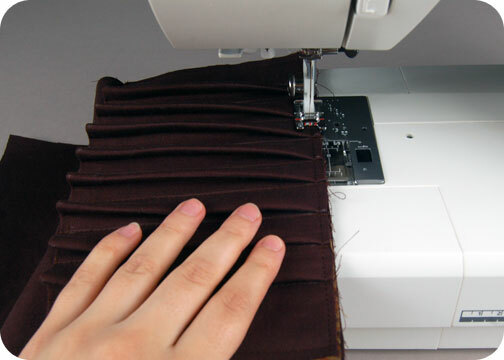 The pattern guidelines indicate where to pleat and where to stitch, so don’t let all the different lines bog you down. 5. Here it is with all the pleats and stitch lines made. When the last stitch line is done, the right side of your pocket piece should be perfectly flush with the right side of your Journal Inside-Left piece. If it’s not, you might want to check that all of your pleats were done correctly, they should be roomy enough to fit a pencil. 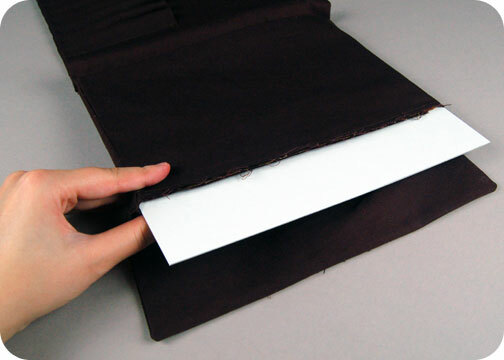 If everything seems fine though, don’t worry too much about the excess fabric and just trim it off, then baste the right side of the pocket section to the Journal Inside-Left piece. 6. 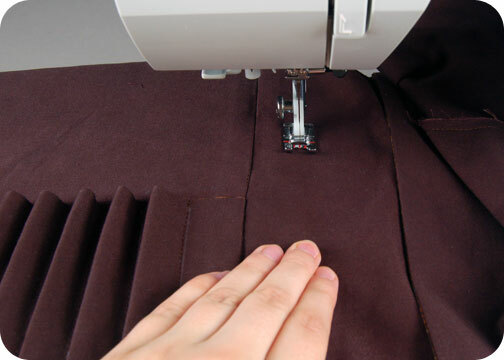 With the pleats all made and the sides securely in place, baste the bottom section in place as well. 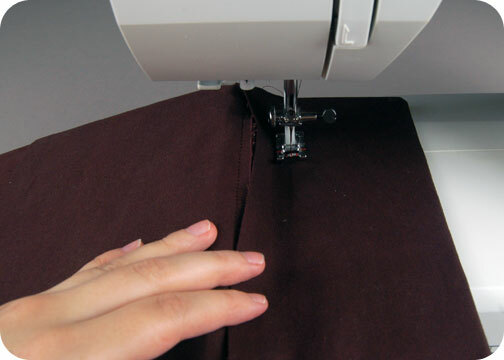 Be sure all the pleats are folded in the same direction for the best look. You may want to iron them if you want a very crisp look, but it’s not necessary. 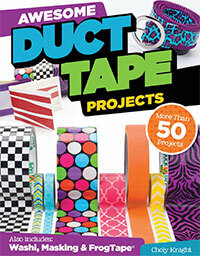 Now congratulate yourself, because you just finished the pencil pocket section! 7. The remainder of the inner journal continues with the book slot. 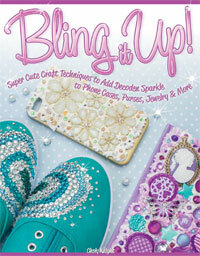 Begin by layering your book slot piece with its corresponding lining piece. Match up the raw edges, particularly along the notched edge. 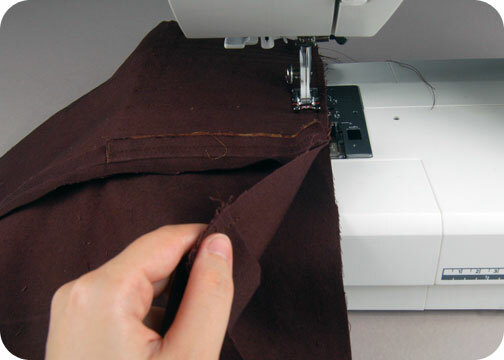 Sew along that one notched edge, then turn it right side out and press the seam flat just as in step 1 with the pocket piece. 8. 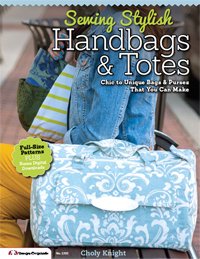 Grab your Journal Inside-Center piece and line up your book slot along the right edge of the piece. Match up the raw edges and it should line up as the guidelines indicate. Baste the slot in place along the bottom, top, and sides. 9. 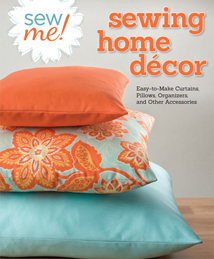 Next you’ll want to take your Inside Journal Left and Center pieces and sew them together. 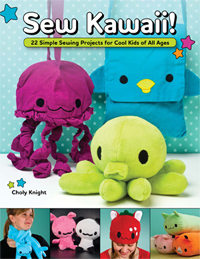 Match up their raw edges along the notched side, then sew them together along that edge. This is so that when you press the seam open, they still remain on the left and center, respectively. 10. 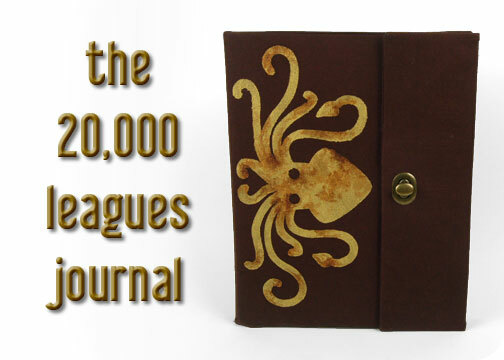 Lastly you’ll add the remaining section, the Journal Inside-Right section. Match up the double-notched edge of both pieces. This seam will be basted, as we’ll be ripping it out later in order to turn the cover right side out. 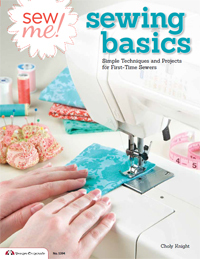 With that in mind, sew at a regular stitch length for about ⅝”, then switch to your longest stitch length. 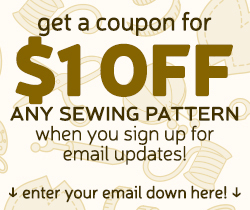 At ⅝” from the end, switch back to your regular stitch length and continue on. 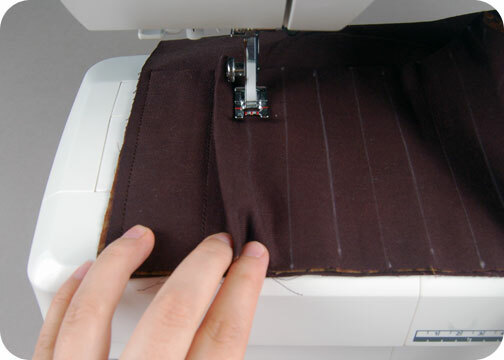 When the seam is sewn, press it away from the center piece, towards the Journal Inside-Right piece. 11. 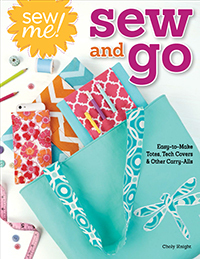 With all of the inner sections complete, you can now sew on the outer cover of the journal. Layer the pieces together with right sides facing, and line up all the raw edges. The sew entirely around the perimeter of the journal cover. 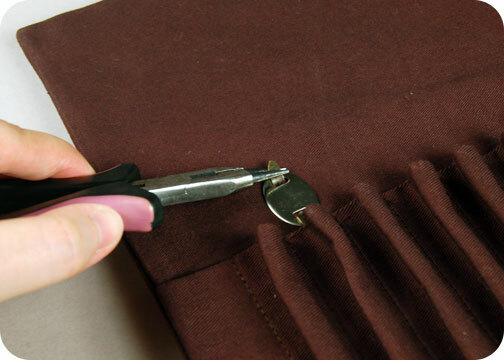 When you finish, trim the seam allowances to about ¼” and also clip the corners so they turn crisply in the next few steps. 12. 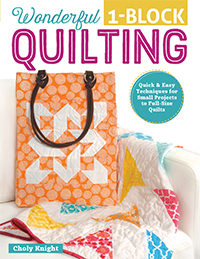 To turn the cover right side out, we’re going to go back and pick out the stitches from step 10. Rip out the entire seam (carefully) because we’ll be slipping the mat board in through this opening as well. When you finish, turn the cover right side out, poke the corners with a chopstick or other similar tool to get some good definition, then press the whole thing very well so the edges are nice and crisp. 13. Next we’re going to start sliding in our pieces of mat board. Start with the one labeled A, and slide it into the opening you’ve ripped open towards the left. You might have to bend the board ever so slightly to make it in, but the fit should be better once you get it most of the way. It should still be a little snug though, that’s a good sign 😀 Make sure the board is shoved way down into the corners before going onto the next step. 14. 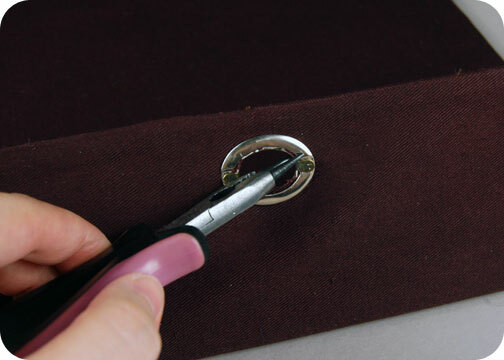 Once your first board is snugly in place, you’ll want to sew it in place by sewing a seam just outside of the board, going all the way down the case. 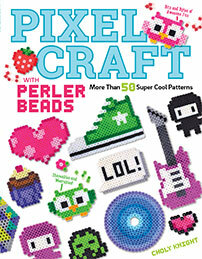 There are stitching guidelines on the pattern to give you an idea, but for the most part let the board be your guide. When you’ve finished with the seam after board A, repeat step 13 with board B – really shoving it in there so it sits snugly against the last previous board. Now sew it in place just as you did the previous board too. So now you should have two boards in place and two rows of stitching. Before the next step, slide board C in place as well, just like with the last 2 boards. 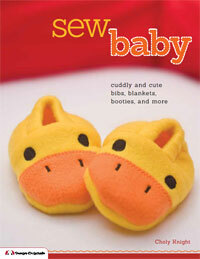 Get it so it’s good and snug, but don’t stitch it in place. 15. Before we stitch board C in place we’ll have to get the last boards in there as well. Slide board E towards the right, getting it good and snug. 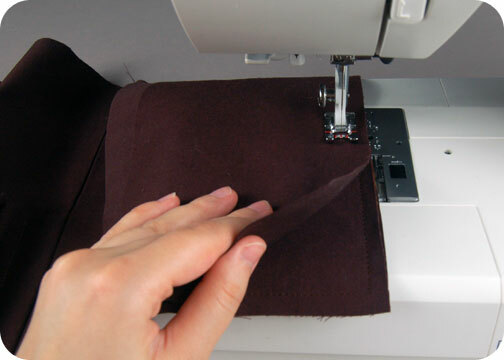 Then sew it in place just as in step 14. 16. After sewing board E in place, slip in board D, also towards the right. It should just barely fit under the last open section of the inner case. When you flip it over the board, edge stitch it in place which will secure both boards C and D.
17. 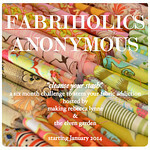 Just a few more finishing steps to go and this baby is done! Begin by cutting away at the section for the opening of your turn lock closure. 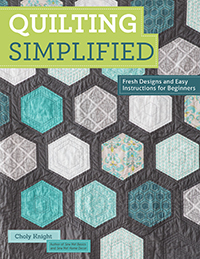 This should be on the left side of the cover (when looking at the outside) – be sure to read the pattern guidelines so you get the right idea. I found using the chisel blade of my x-acto was the best way to cut through all the layers of mat board and fabric cleanly so as to get the turn lock base through. 18. 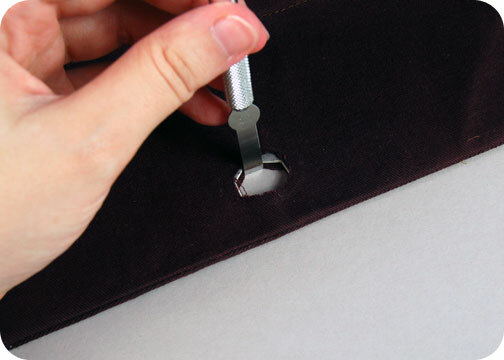 When you’ve cut the hole to the sufficient shape and size, your turn-lock base should snap right in. Install it with the proper tool and anchoring piece and one half of your turn-lock is done! 19. Install the lock side of the turn-lock on the other side of the case, using the common method of pressing the prongs down onto the case to find the right placement, then cutting slits into the case so it can be inserted snugly. Anchor it in place with the corresponding base piece and bending the prongs back as shown. 20. And the very last step is painting on your squid motif! 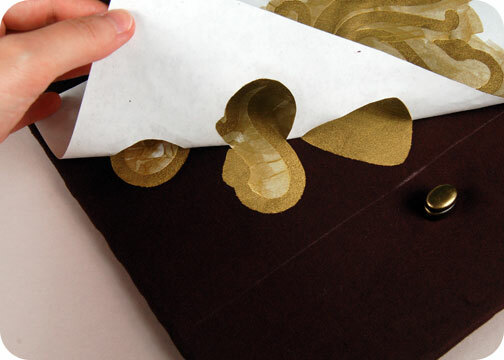 See the tutorial for fabric painting with stencils to see how to apply it. But basically all that’s left is to apply the stencil centered nicely on your case, then paint it on! Now go off and jot down some adventures because YOU’RE DONE! Whew! I realize that was a lot of work, but hopefully you thought it was worth it ^-^ I just love projects like these that are hard and sturdy. They really make it seem like you can create something that looks completely professional and like it was manufactured, but with stuff you have around the house! 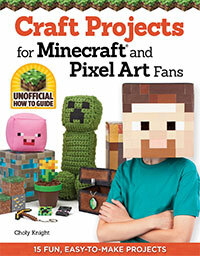 I must make this when I have the time. Is it okay if i try to make this? Of course! Please do 😀 I’d love to see how it turns out!